Vincent Lavandier has agreed a two-year contract to remain as Glasgow Rocks head coach. The Frenchman, who admits he likes “the challenge” of pitting his wits in an overseas league for the first time, has gone 7-2 at the outset of his interim deal at the Emirates Arena in guiding the Scots into the BBL’s top four. 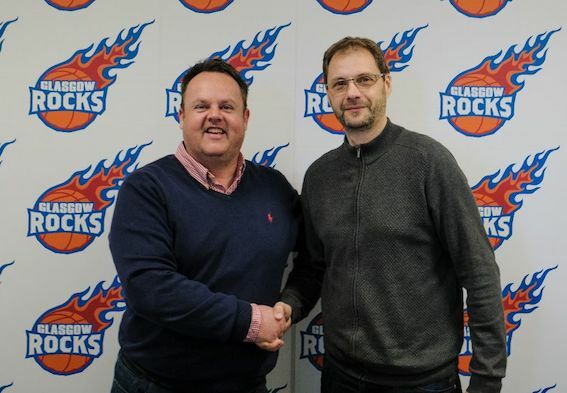 “I thank the Rocks organisation and especially Duncan Smillie for their confidence in me,” he said. “When I came, I discovered a structured club, a championship and fans who welcomed me very well. It seemed natural to continue the adventure here in Glasgow. So, I thank my players who, thanks to their listening, their daily investment has allowed me to get good results lately. The move has had the support of a number of senior players with the Rocks moving to sign him in the face of rival offers from two clubs in the Belgian League. “He’s one of the best coaches I’ve worked with,” Gareth Murray declared. “We had Thorsten Leibenath here in my first year who was on another level but Vincent’s right up there as well. The Rocks visit Leicester on Friday night. ← Previous Story MILLION POUND DROP FOR BBL?